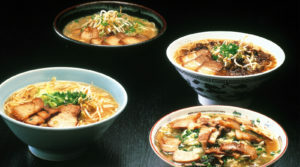 Discover some of Japan’s most popular dishes. The most famous – and possibly the most popular – Japanese food, sushi is widely enjoyed around the world. Super fresh, delicately sliced fish eaten raw with soy sauce and fiery wasabi. Widely regarded as the most exquisite culinary refinement in Japan. Small pieces of seasoned chicken or other meat and vegetables, cooked on skewers over a charcoal grill. Crispy crumbed pork cutlet, fried and usually served with a distinctive, fragrant sauce and salad. A slightly sweet hotpot dish made with thinly sliced beef with vegetables, tofu and more. Fine slices of beef and vegetable are swirled in a pot of bubbling water, then dipped in a special sauce. Fish, seafood and vegetables coated in a very light and crisp batter, deep-fried in vegetable oil. Cheap, available everywhere and delicious! Is it an omelette? Is it a pizza? Whatever it is.. it’s darn tasty!